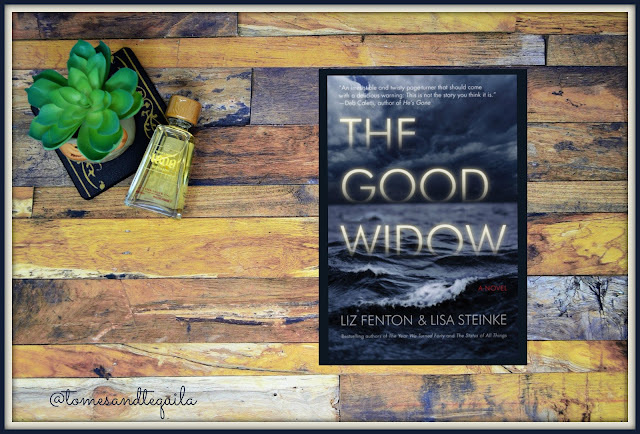 For my book club this last month we read The Good Widow by Liz Fenton and Lisa Steinke*. This isn't the first book of theirs that I've reviewed on the blog. 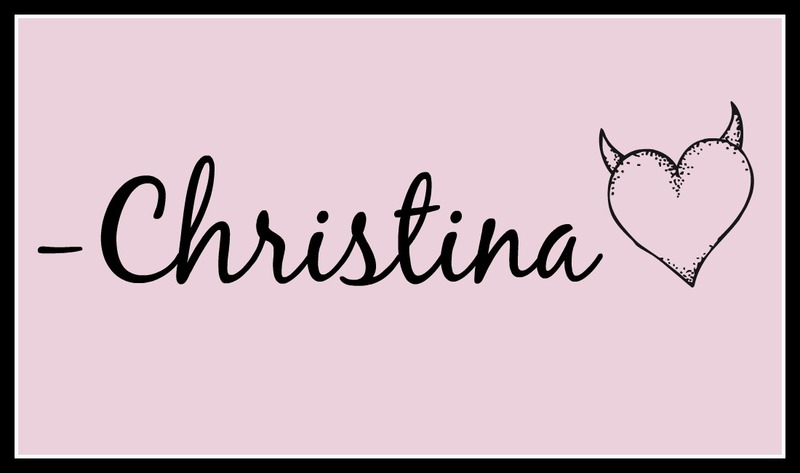 You can find my reviews for The Year We Turned Forty Here, and Your Perfect Life over Here. I love that these books are written by two best friends, and most of them center around women close to my age, and are just all around great book club selections. 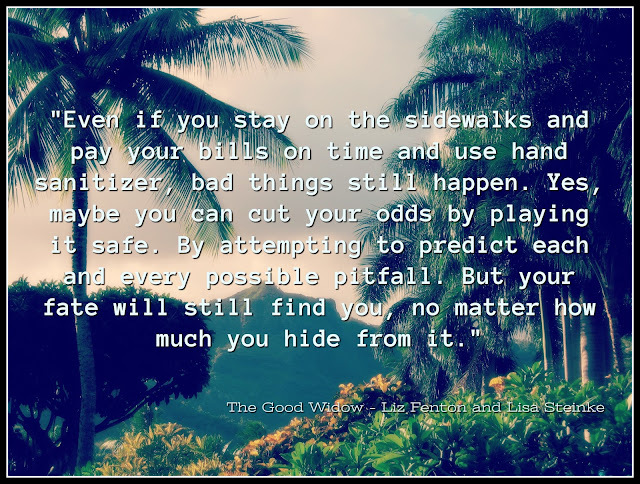 The Good Widow had a different feel than their previous books, as it's more of a mystery/thriller. Teacher Jacqueline "Jacks" Morales has been reasonably happily married to James for eight years, and although things haven't gone exactly as she'd hoped they would, her life isn't bad. But when the cops show up on her doorstep to tell her that her husband has died in a car accident in Hawaii, when she thought he was on a business trip in Kansas, her life is turned upside down. Things only get worse when she finds out he wasn't alone in the car, but was with a beautiful younger woman. When Nick, a good-looking fireman, shows up at her house and tells her his fiance is the woman who died with her husband, Jacks is intrigued. Can he help her figure out what was going on with the deceased couple, and what they were doing in Hawaii together? Will Jacks be able to figure out the man she thought she knew so well? And will her life ever be the same again? I really enjoyed this book. As someone whose husband has traveled for work a LOT over the years, this has to be a woman's worst nightmare. Not only to lose your spouse, but then to find out that he's possibly led an entire life that you didn't know about? How do you even recover from something like that! And since he's passed away, you can't even beat him upside the head until you get all the answers you want! And you can't beat the other woman upside her head either because she's dead too!!! Worst...........nightmare. I thought Jacks was a likable character, who occasionally made questionable decisions, but I'm sure if you were in her situation, you would also. The mood swings she suffered, and most definitely her guilt over laughing and smiling again, were I think spot on for what a lot of people feel after the loss of a loved one. Because no matter what she discovered about James, he was still her husband of eight years, and she loved him. That doesn't go away because someone did something wrong. So, I came out of this book loving Jacks. So, if you haven't read this one yet, put it on your Christmas list. Or buy a copy for your friend who reads things by Liane Moriarty, Ruth Ware or B.A. Paris. *This post uses affiliate links. Please visit my review policy for more information.